Another 1st for Richard and our horse Whiz! Once in a while I feel the urge to brag on my husband and this is one of those times. 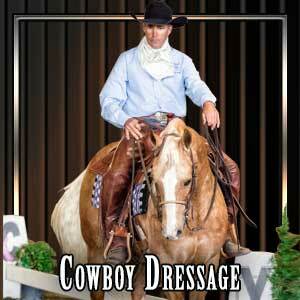 Richard was asked by one of his clients to take a horse to a Cowboy Dressage show. When the scores were tabulated, Richard and our horse Whiz placed 4th in the Top Hand (Toughest Division) and our horse Whiz went on to place 1st after the top 5 competitors had to draw and switch horses amongst each other for the final portion of the contest. It was quite amazing to have a horse that had never been to a Cowboy Dressage competition, prior to this event, come out as the number 1 horse, at a year end finals competition. It renewed my faith and confidence as to what an amazing trainer and horseman I am married to, Mr. Richard Winters you are my hero! Whiz has been my favorite horse for many years so you both have my love and admiration! Murieta Equestrian Center, in Ranch Murieta, California hosted the Cowboy Dressage Final Gathering. Cowboy Dressage has been at the forefront of a revolution in equine competitions and equestrian lifestyle and focuses on riding with softness, lightness and partnership with your equine companion. There were riders representing states including, California, Washington, Oregon, Idaho, Montana, Colorado, Texas, Oklahoma, Kansas, and probably a few others. The Canadians were very well represented. Great Britain, Poland, Germany and Australia were also represented. It truly was a gathering of the Cowboy Dressage World. A large variety of horses were represented as well. Morgans were there in high numbers, but so were Quarter horses, Appaloosas, Paints, Arabians, Ponies, Saddlebreds, Mustangs, Fjords, Haflingers, Tennessee Walkers, Pasos and Rocky Mountain Horses. The big history-making event at this year's final gathering though, was the Top Hand competition. This was the first year for this elite competition for Cowboy Dressage's top competitors to all throw their hats into the same ring. Each rider rode the same test, W/J/L 2. This test on the surface doesn't look terribly difficult. It requires many of the standard maneuvers that many of our CD tests ask for. The killer maneuver in this test is what we call the "bow tie". This asks for the horse to lope half of a 20 m circle then change direction over the ground poles on the short diagonal with a lead change through the jog within the box (8-a-gon) then another half of a 20 m circle holding that lead through the box and then transitioning to a working jog. It sounds easy enough until you try to ride it. Out of the 28 horses and riders that ended up competing in the Top Hand, probably only a handful managed their two trips through the bow tie without a bauble. That one maneuver requires such timing, softness and precision to execute perfectly is what really separates the cream from the milk. When the top 10 finalists were announced, we were still in the dark trying to guess who the top five final competitors would be. Cowboy Dressage World kept us all on the edge of our seats waiting until right before the moment they were going to have to ride onto that court to see who the top five were. Once they were announced, then a Calcutta was offered and each rider was auctioned off to the highest bidder. As each rider was being bid on they did their best to put on a show of their best horsemanship and the training that their horses had attained. A couple of the riders removed bridles, (Richard Winters was one of them! ), did sliding stops, spins, lead changes, all in front of the screaming audience while, I'm sure, trying to go over the test they are about to ride in their heads. All 5 teams were calm, cool, collected and rode like they had ice in their veins. Each of the riders had amazing rides on their horses in their next test, which was a brand new test to all of us. This test again, had all of the elements we've all ridden before but in different order with shorter quicker transitions than we had seen before. Those quick transitions, when riding with soft feel and lightness can be difficult to execute with precision, and it was completely gratifying to see them all do it well. The field was pretty much wide open after the first go and then the real fun began as they drew to swap horses. The final 5 horses were as different as can be as a group. There was a Paint, a Morgan, and three Quarter horses who were all different types of quarter horses. The competitors had 2 minutes to ride their new mount, at a walk before the testing began. Then right before their test they had another 2 minutes before their bell rang and they rode into the court. You could have heard a pin drop in that arena. We collectively held our breath as each rider rode in. When the dust settled and it was all said and done, it came down to who had the best go on the horse that they drew. Our Top Hand rider, Megan Gallagher had an amazing ride on both her Morgan and the beautiful Quarter Horse that belonged to Richard Winters. Megan exhibits everything that the Top Hand rider should. She is a kind, wonderful lady and an excellent horsewoman. Her ride on Richard's horse was soft, quiet, and gorgeous. She is what we are all striving to be. Any one of those top 5 riders could have been the top hand, honestly. The differences in scores between them all were minute. When we first dreamed up the Top Hand competition this is exactly what we were hoping for. It was a stunning exhibition in soft feel and partnership and it brought in folks from far and wide that had never shown Cowboy Dressage before.